Martial Law in Missouri by George Caleb Bingham, 1870. “Come on, then, gentlemen of the slave states. Since there is no escaping your challenge, we accept it in the name of freedom. We will engage in competition for the virgin soil of Kansas, and God give the victory to the side which is stronger in numbers, as it is in right. 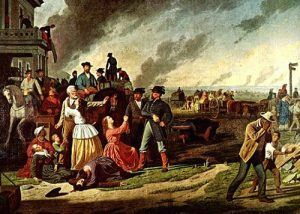 Bleeding Kansas or the Kansas-Missouri Border War was a series of violent civil confrontations between the people of Kansas and Missouri that occurred immediately after the signing of the Kansas-Nebraska Act in 1854. The border war began seven years before the Civil War officially began and continued into the war. The issue was whether or not Kansas would become a Free-State or a pro-slavery state, which resulted in years of electoral fraud, raids, assaults, and retributive murders carried out by pro-slavery “Border Ruffians” in Missouri and anti-slavery “Jayhawkers” and “Redlegs” in Kansas. On May 30, 1854, the Kansas-Nebraska Act was signed, which opened the two territories to white settlement primarily so that a railroad could be built across the vast plains to the Rockies. Though the area was reserved for the Indians, the treaty was disregarded with the coming of the steam engine. Little did those long ago legislators realize the chain of events they had set in motion that would end in the Civil War and usher in an era of violence that would plague the plains for the rest of the century. 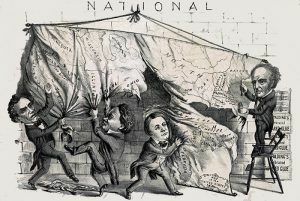 The Kansas-Nebraska Act also repealed the Missouri Compromise and reopened the issue of extending slavery north, allowing the two territories to decide the matter for themselves. 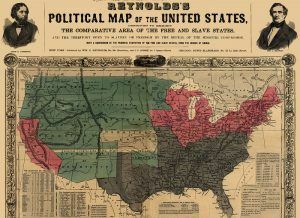 As a result, settlement of the state was spurred, not so much by westward expansion, as by the determination of both pro-slavery and abolitionist factions to achieve a majority population in the territory. With congressional power in the grip of the Southerners, the federal government placed the volatile issue of slavery into the hands of those settling the new territories. Abolitionists, especially strong in New England, were pitted against Southerners, who realized that if Kansas became a Free-State; their strength in the Congress would be eroded. To the South, this tip in congressional power was a threat to their political, economic and cultural existence. Pro-slavery interests in and throughout the South took counteraction. Towns were established by each faction – Lawrence and Topeka by the Free-Staters and Leavenworth and Atchison by the pro-slavery settlers. On August 1, 1854, 29 northern emigrants, mostly from Massachusetts and Vermont, were the first to arrive in Lawrence, Kansas, named for Amos A. Lawrence, a promoter of the Emigrant Aid Society. A second party of 200 men, women and children arrived in September. Soon all the tasks required to organize a new territory for statehood would become secondary to the single issue of slavery. The First Territorial Capital at Pawnee, Kansas was only used for one session, before moving to Lecompton, Kansas when the pro-slavery advocates were in control of the state. By Kathy Weiser-Alexander. On October 16, 1854, the first anti-slavery newspaper was established to voice the sentiments of the New England Emigrant Society. The newspaper called the Kansas Pioneer further enraged the pro-slavery supporters. Pro-slavery Missourians flooded the state to vote at the first election in November 1854, where armed pro-slavery advocates intimidated voters and stuffed ballot boxes. Andrew H. Reeder was elected as the first territorial governor of Kansas. Another election was held in March 1855 for the first territorial legislature. With the pro-slavery advocates winning again, the members ousted all Free-State members, secured the removal of Governor Andrew Reeder, adopted proslavery statutes, and began to hold their sessions at Lecompton, Kansas about twelve miles from Lawrence. Severe penalties were leveled against anyone who spoke or wrote against slaveholding and those who assisted fugitives could be put to death or sentenced to ten years hard labor. 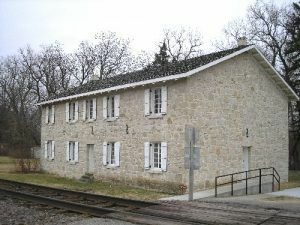 In July 1855, the first territorial capitol of Kansas was completed of native stone at the now extinct town of Pawnee on the Fort Riley reservation. However, due to its distance from Missouri and the pro-slavery faction that controlled the Kansas legislature, its use was short lived.